This semester we are trying to eat healthier. We've been good so far. Last night we had a late dinner and I was trying to think of something quick and easy I could put together. How about a salad?! Pulled the lettuce out and got it all out on the plate. Chopped up some carrots, cucumber, and tomato. Then! It came to me! 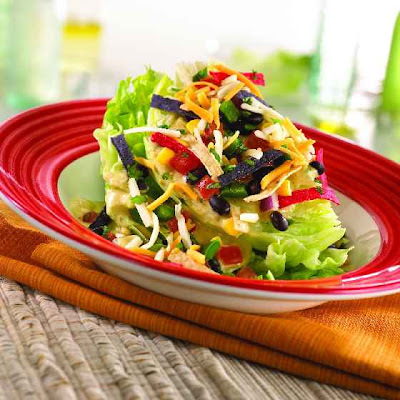 A southwest salad! We had some Hidden Valley Southwest Chipotle, then added some Cuban black beans, corn, bacon bits, and tortilla strips! :) There you go a southwest salad. It was delicious! This is not my picture :( I forgot to take one, but mine definitely look very similar! and totally understandable that you forgot to take a picture of your food. i do that all the time. it just looks so good that i start eating. and then when its half gone, i realize "shoot! didn't take a picture of my awesome food!" That sounds delicious! I'm definitely gonna have to give that a try! I am so trying this! Looks delicious! Love the blog! Mmmm this looks super yummy. I'm always on the look-out for new recipes that won't contribute to the jiggle I already have goin' on. ;-) I'll have to try this one; thanks for posting! SO glad I found your adorable blog through the blog hop. I can't wait to read more! !